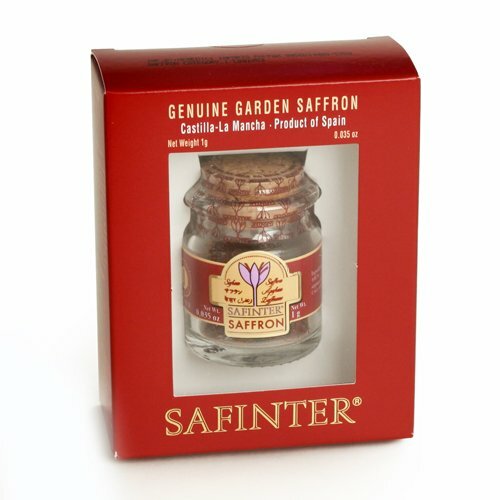 Saffron is the golden stigma of the purple fall crocus and is the world's most expensive spice. The value of this spice is derived from the fact that it is such a labor-intensive crop. Only five to seven pounds of saffron can be produced from each acre of land. The flavor of saffron, however, is very concentrated. One gram of saffron is enough to flavor forty servings of saffron rice or two large batches of paella.Our saffron is Pure Mancha Superior Saffron from Spain and comes in individual boxes sealed as Genuine Spanish Saffron. The adorable, clear boxes are imprinted with "The Gathering of Saffron" and pictures of a woman picking saffron strands by hand and a family gathered for paella.